Luan Gaines interviewed author David Fulmer about his novel The Blue Door , the rock 'n' roll music scene in 1960's Philly, and building characters from spare parts. 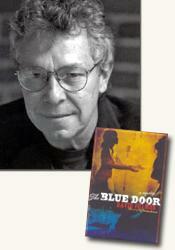 Interviewer Luan Gaines: What was your inspiration for The Blue Door ? Are any of the characters based on real people or events? David Fulmer: There was a guy in my small hometown in Pennsylvania who went off to Philly to become a club boxer. Every once in a while, he would show up, and he was just so bad that my friends and I would just stare at him. He was like a jungle cat. So he was the beginning of Eddie’s character. A couple of my uncles on the Sicilian side went into Sal’s character. There are real figures in the music business in New York and Philly in the ‘50s and ‘60s whom I blended into George Roddy. That’s how I build characters – from spare parts. Eddie Cero realizes he is done as a fighter after his loss to T-Bone Mieux. What would the future have to offer such a man in 1962 Philadelphia? His choices would be manual labor, sparring, or working for the local mob as an enforcer. Eddie’s fortunate to run into Sal and find himself in a unique situation. Can you describe race relations in 1960’s Philly? What does race have to do with the police investigation of Johnny Pope’s disappearance? Race relations were tense everywhere. Philly was no exception. However, it was far better than anywhere in the South. You had very popular black ballplayers for the Eagles, Phillies, and 76ers. And, as always, music jumped color lines. So the race situation was more fluid and open. As to Johnny’s disappearance, it got short shrift, because official policy denied blacks equal attention. Black victims just didn’t rate in importance, no matter who they were. Sal isn’t exactly the cream of the PI industry, just an ex-cop with a tendency to drink too much, trying to makes ends meet after retirement. Given his current circumstances, why does this job appeal to Eddie? It doesn’t, at first. It’s just a place to spend time and make some money while he’s waiting for something else to come along. Or until his cut heals and he can get back into the ring. Sal has kept close contact with the department since retiring. How does his use of active duty detectives aid in the agency’s investigations? Is this usual? Unusual? For some police officers, once a cop, always a cop. Especially those like Sal, who might need the help of his former cop pals any day of the week. In The Blue Door , I get to introduce two former cop buddies. Al Nash is a good guy who helps Sal and Eddie move the case forward. Don Hayner, now retired, is on the other side. His confrontation with Sal and Eddie is one of my favorite scenes in the whole book. Does Eddie have any relevant skills to bring to his new job at SG Investigations? If not, what does Sal see in this battered young man to make him offer a job? I never thought about it. Eddie was there. Sal needed the help. Neither one of them seemed to take it as a real job situation. Until later, that is, when Sal actually offers Eddie something more permanent. I guess what he sees is a guy like himself, tough, but with a reservoir of quiet kindness. What is it about Johnny Pope and the Excels that captures Eddie’s interest in the singer’s disappearance? While on a case for Sal, Valerie Pope comes to Eddie’s attention, perhaps a key witness to her brother’s disappearance three years earlier. Does Eddie have any idea of the problems a relationship with Valerie would cause? Should he be more aware, or does he care? Boxing and music are two endeavors that crossed the color line early on. For both of them, long before Jackie Robinson and the integration of the Army. So Eddie doesn’t have so much of a problem with race. Also, Italians were considered second-class citizens in certain “respectable” quarters, and he has experienced that, too. In any case, it’s not a big deal until he begins to develop a crush on her. Although the early days working for Sal require only patience, Eddie Cero soon learns the dangers of his interest in Johnny Pope. How does Eddie’s white face disturb the black community when he starts asking questions about Johnny Pope? I don’t think his skin color is all that much of an issue. It’s just an excuse. The real problem is that Eddie is poking around what everyone thought was a closed case. No one wants that, and he reasons why are revealed deep into the book. What does Ray Pope’s death mean for Eddie? What is the significance of the second killing? Johnny Pope’s disappearance is an abstraction. Ray’s death is real, and immediate, since Eddie saw him hours before. But because Ray was a bellicose loudmouth, there’s always the chance that he just got into something with someone. The second death means that’s clearly not the case, and that Eddie has stirred up a murderous hornet’s nest. Valerie is cold to Cero at first, warning him off the investigation. Why does her demeanor change toward him? Does his denial of Valerie’s possible role put Eddie in jeopardy? Why? Her demeanor changes as she realizes that he’s not going to go away. For his part, his gut tells him that she’s not involved in her brother’s disappearance. However, it’s not clear that it’s his gut talking. Maybe his heart. Maybe another part of his body. In any case, he does not take Sal’s advice and treat her as a suspect. Which means that if he’s wrong, he could be walking into a trap. Eddie knows enough to follow the money, leading directly to George Roddy, who puts on a façade of respectability. Is Roddy a good example of the corruption in the early years of the recording business? Explain some of the temptations Roddy faces. The record business was corrupt because no banks would finance these crazy people making records for kids. The bankers couldn’t (or wouldn’t) see the writing on the wall. It’s also no secret that the music establishment – including important figures like Frank Sinatra and Mitch Miller – despised the rock and roll crowd. So the record producers had to take money from other sources. Which put them in bed with loan sharks. The other side of the coin was that the artists were woefully uniformed and unprotected. Some were just kids. Others were unschooled and illiterate. So for a man like George Roddy, stealing from his artists would be easy. And that happened all the time in the early years. It’s a shameful legacy, but it was part of the birth of this new music. T-Bone Mieux is a dirty fighter, as Eddie learns in his last welterweight match. Why has Mieux got a bad attitude about Cero? There are boxers who are class acts. Athletes who control whatever impulses brought them to the ring and channel them into an athletic performance, violent as it may be. Then there are creatures like Mieux, who have dangerous tendencies and look to boxing to make money on them. These guys don’t last, but before they go down for the last time, they’ll trot out every dirty trick in the book. In this particular case, Eddie has humiliated Mieux more than once and is on his way to doing it again. So Mieux does the only thing he can do: he fights dirty. Beneath the slick veneer of the music industry is the reality- greed, ambition, organized crime, gambling. Can you describe Johnny’s world as a break-out star and what such an opportunity means to him? Johnny was modeled on stars like Sam Cooke and Frankie Lyman. They were black kids with enormous talent and drive who made it to the top and then met tragic ends. That they got as far as they did is a testament to their persistence to escape and do something grand. However, they all ran smack into the realities of what happens in cottage industries that become awash in money. The sharks circle. Johnny was on just such a path and had it all, until he disappeared for good. Do artists like Johnny, coming out of the 1960s, have to rely on white agents and record producers? How long does it take before they have other options? Many of them never had a chance at any other options. But Sam Cooke had broken away and started his own record company before he died. The first black artist to do so. Motown was the first major black-owned record label. How much does your love of music define the time and place of The Blue Door , for example the booming recording industry of 1960s Philly, the Payola scandal, the birth of rock n’roll? As always, I hope it helps to set the stage. I want to create settings that include the sights, sounds, and smells of a particular place, but also include the history, since nothing happens in a vacuum. Part of the historical milieu is the music. So that’s part of the setting. More so because this is a narrative about the music business. Your novels have race, music, romance and violence in common. Although set in another time frame, The Blue Door certainly fulfills the requirements. Does Eddie Cero have a future, as in another novel? We’ll see. It’s a business decision between my publisher and me. Is it difficult to navigate the various time frames of your novels, especially when writing a series? How do personal interests play a part in your story choices? I personally feel at home with the settings. I got familiar with Storyville, New Orleans and 1920’s Atlanta through research. I did research on South Philly, but I was also alive and visited that setting as a kid, so it was the easiest for me to navigate. Speaking of a series, when will your fans see Valentin St. Cyr again? David Fulmer's first novel, Chasing the Devil’s Tail, was a finalist for the Los Angeles Times Mystery/Thriller Book Prize and the winner of the Shamus Award for Best First P.I. Novel. He lives in Atlanta. Luan Gaines is a contributing reviewer to curledup.com. Her interview with David Fulmer was written in conjunction with her review of The Blue Door . © Luan Gaines/2008.